1. I am feeling pretty good post marathon, my quads were really sore Monday and Tuesday, a little sore yesterday and maybe just a tad sore today. I haven't run at all yet and I am okay with that. I am determined to take my whole rest week! Maybe this weekend I will go for a short easy run. 3. 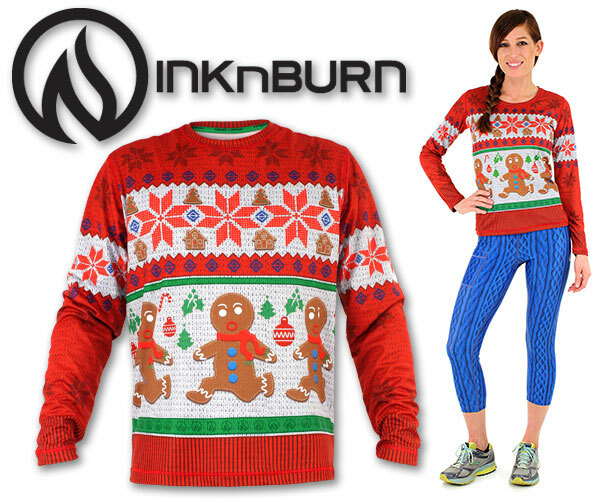 If you have a Holiday themed run in mind...Inknburn has a Holiday pre-order up right now that is pretty fabulous. I hope you figure out the shoulder thing! At least you're in a recovery period so you can let it calm down! Oh no! I hope your shoulder feels better soon! Pain during running from any part of your body stinks! Love the holiday look from Ink n'Burn, especially those capris. So fun! Glad your legs are recovering and hope you get that shoulder situation fixed up soon. So aggravating! The shoulder is hard, I hope you get some answers. I had frozen shoulder several years ago and now the pain seems to happen in my right shoulder when I run. Hope you figure out what is going on with your shoulder! I love the new INB sweater, I bought one for me and one for A.